In recent years, zirconia frameworks are fabricated with row-stage zirconia blanks using CAD/CAM technology. Furthermore, a newly developed fiber reinforced plastics (FRP) frameworks nowadays is used for FPDs because of high toughness. 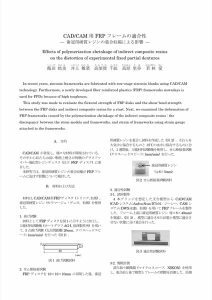 This study was made to evaluate the flexural strength of FRP disks and the shear bond strength between the FRP disks and indirect composite resins for a start. Next, we examined the deformation of FRP frameworks caused by the polymerization shrinkage of the indirect composite resins : the discrepancy between the stone models and frameworks, and strain of frameworks using strain gauge attached to the frameworks. Copyright 2019 Jikei Group All Rights Reserved.